Hot Games Gaming Blogger Template is a theme for gaming and clans. It allows you to create and manage gaming based blog to publish cheats, walk throughs and mod related to online or offline games. It can be perfect if you are planning to create a Twitch, Streamer, Blogging, Video or Gaming website. 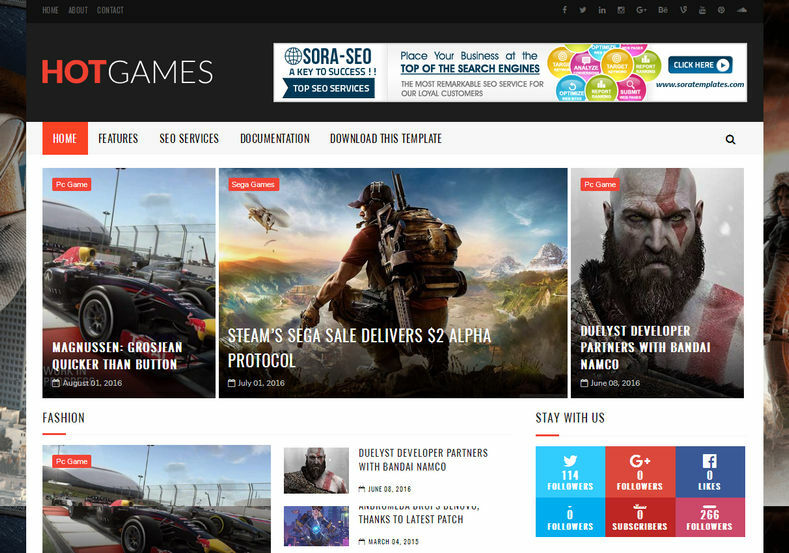 This gaming blogspot theme will offer every feature someone might want in a gaming blog or magazine, because this thing is packed with great features and admin options, so you can add and filter gaming related articles and much much more! Created with Clean and pure coded HTML, CSS, jQuery, Documentation is included in your downloaded package and created by top SEO technologies so the website will generate much more organic traffic than before. It is a professional and most suitable template for gaming niche with everything matching with the concept. Seo Ready, Games, Ads Ready, Responsive, Adapted From WordPress, Fast Loading, Browser Compatibility, White, 1 Right Sidebar, 3 Columns Footer, Technology, Social Bookmark Ready, Slideshow, 2 Columns, Drop Down Menu, Post Thumbnails, Page Navigation Menu, Fashion, Personal Pages, Magazine, Elegant, Clean, Black, Multi Colors .